transformation – Journey to my heart…. I saw this picture the other day on Facebook and have come back to it often. Some of what it represents to me is: lightness, humor, honesty, struggle, depth, challenge, hope, transformation…..
Would your image transform your age…. 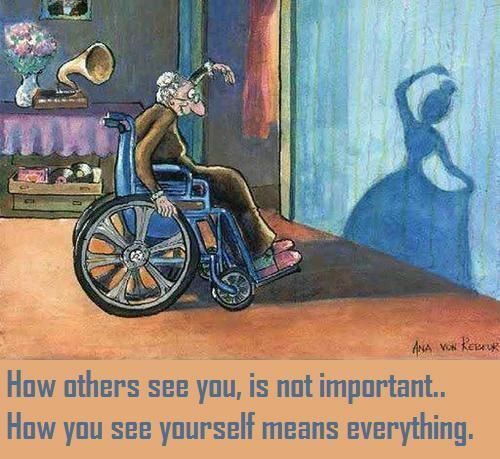 Would your image fill you with external beauty…. Would your image communicate the ease and grace of a ballerina…. I love pondering this one and find it a bit challenging to find my answer…. I am going to allow my mind to wander freely tomorrow on this one and delight in the images that come to mind. I invite you to do the same….dream of all you can be if you allow your spirit to live free within you! Author trishborgdorffPosted on February 10, 2012 February 10, 2012 Categories UncategorizedTags honesty, struggle, transformationLeave a comment on How you see yourself….